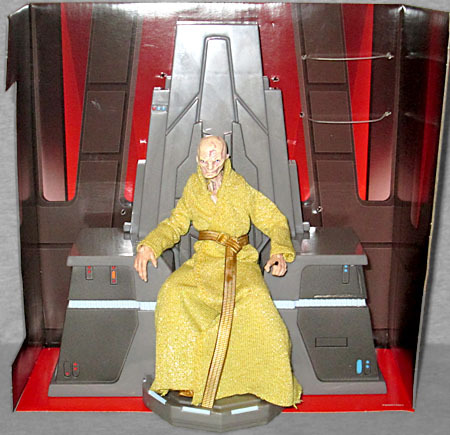 I wanted to wait for a sale on this guy, but I don't know what the odds are that we'll ever see Supreme Leader Snoke half off. The shadowy commander of the First Order, Supreme Leader Snoke prefers to operate from a distance, looming over his underlings in the form of an immense hologram. As the First Order rallies, this master of the Dark Side emerges from the shadows to seize victory. Oh man, "an immense hologram." That takes me back! Remember after The Force Awakens, when some people (who are confused by the most basic of visual language) thought that Snoke was an actual giant? In fact, that was one of Seth Abramson's idiot "plot holes." Good times, good times. Anyway, between The Force Awakens and The Last Jedi, fan speculation ran rampant about who Snoke was and where he came from, but none of us guessed the final revelation: that he was a messed-up clone of Yoda, infused with the DNA of one of those Kaminoan Q-Tip aliens and inhabited by the disembodied spirit of Savage Opress. Bold move by Rian Johnson! Whereas Palpatine was vain, wearing the hooded cloak that had once protected his identity to instead conceal his scarred face, Snoke seems unconcerned with his twisted visage, re-created excellently by this toy. He has the deep, crooked scars on his pate, and his left cheek is a hollow mess, like someone who lost their jaw to cancer. The physical decrepitude does not stop at the neck. Snoke's throat is as distended and ripped as his face - the phrase "beef jerky tracheotomy" springs to mind. His only other exposed skin is on his hands, which are equally twisted and gnarled. 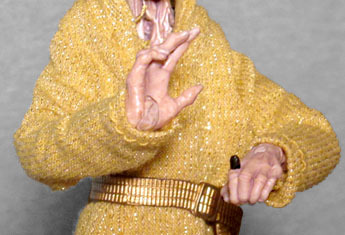 His right hand has the first two fingers extended, in a "Force-using" pose (or possibly because the rheumatism keeps him from straightening the others), while his left hand is curled up. His large obsidian ring - allegedly a chunk from Darth Vader's palace - sticks up off his index finger. 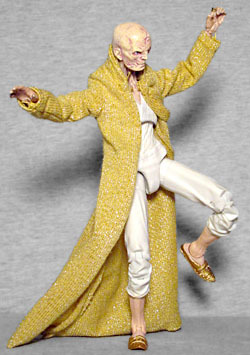 Nobody judges how the elderly dress, so Snoke is just chilling in his golden robe and slippers. Or wait, is that a housecoat? He's wearing it over other clothes, so I think that makes it a housecoat. But it's not a popover, because it opens in the front, and it's too long to be a duster, and I'm not kidding you, these are all real garments with real differences. The robe itself is softgoods, though it's permanently attached at the collar. His belt is plastic, and since it's held shut by a peg, you can pop it off easily. 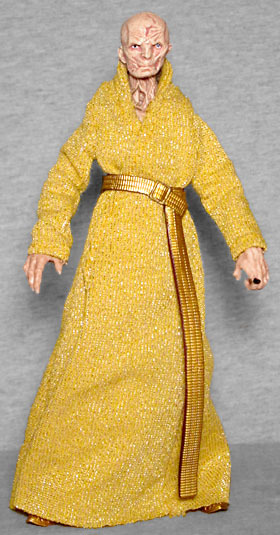 Open the robe, and you'll catch an eyeful of Snoke's white capri pants and his top, which barely manages to conceal the fact that his torso is as desiccated as his face and neck. Snoke isn't human, but he is humanoid - he looks more like Han Solo than Greedo, in other words. But while he's not the giant his hologram led the very, very dim-witted to believe, he is extraordinarily tall by our standards - the toy is more than 7" tall, which puts him just a bit below Chewbacca on the size charts. And yet he still has all the same articulation as everybody else, moving at the ankles, knees, thighs, hips, chest, wrists, elbows, biceps, shoulders, and head. That's pretty spry for an old dude! If you get the normal Snoke release, that's all you get: a super tall old chewing tabacco enthusiast who just got out of the bath. Way to make good financial decisions, nerd. Instead, you should be like me, spending twice as much money to get an accessory to go with him! GameStop has an exclusive version of Snoke [the best exclusive of 2017 --ed. ], which gets you the figure and his throne. 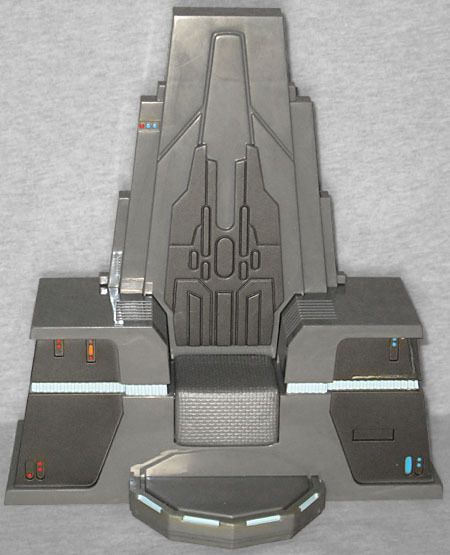 The throne is just a giant chunk of plastic, 8" wide, 8½" tall, and 4⅞" deep. That's so big the foot rest has to be packaged separately so the box can actually fit on store shelves! It's more detailed than you might expect, with a layered back and a sculpted pad on the seat. It's a minorly asymmetrical design, with different lights on each side. 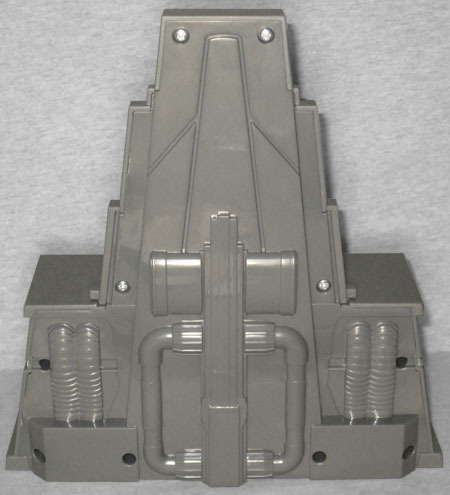 They even bothered to fully mold the back of the thing, though we never see a second of it in the movie! Hot dang, Hasbro! I'm not sure this thing is worth doubling the price of the toy, but then again, yeah, it is. But there actually is a little more value to be had here, and that's the actual cardboard tray behind the figure. The Last Jedi was one of the most visually impressive films in recent memory, and the scenes in Snoke's throne room were the most visually impressive part of that. The best of the best of the best. The tray holding the figure represents a small section of that, which is an awesome idea and someone at Hasbro deserves a bonus for not overlooking it. I didn't plan to get Snoke - he's just the Filene's Basement version of Emperor Palpatine, and that didn't seem worth my money. Then I saw the movie, and Andy Serkis killed it (as he always does), but I still wasn't really sold on the idea of a Supreme Leader Snoke. Getting the throne with him is what did it. It's not enough to have him standing around being an old creep, you need to have him sitting menacingly on his throne, calmly observing all the destruction being carried out in his name. The figure by itself is just okay; the figure with a throne is tops!